For those wondering about EE symptoms in their child. Here is our story, vague as it is. Talking to your child's doctor is so important...no one else is going to come up to you and ask you about your child's gastrointestinal health! He was scoped for EE at age 5 and it was negative. Many upset stomach complaints back then. DS, 10 just dx with EE and ED this week. Eosiniphilic esophagitis and Eosiniphilic duodenitis. Super picky eater for a good year or four. Last six months so many things seemed to bother his 'chest'. "That makes my chest hurt" was a common sentence. With his severe food allergies (egg, peanut, tree nut, kiwi) I was on the lookout for a common thing that was making him not feel well...couldn't figure it out though. The last three months he started randomly vomiting after eating, not terribly frequent, but definitely not normal. His regular egg anaphylaxis is so very gastro-oriented, but this didn't involve major cramping or airway wheezing. He would feel a little nauseous and out it would come...along with TONS of mucous. So much so I ended up videoing the consistency of the vomit t so the doc could see it (gross). After vomiting, he was often better. He also more recently complained of not being able to swallow bread very well. He did not say he tasted acid in his mouth, or felt heartburn. But he called it 'pain in my chest'. Last weeks scope was very positive for EE and for ED. And I'm amazed at how much doctors have learned about this disease in even 5 years. Flovent and Prevacid ordered. More IgE testing to do. Food elimination once we find the culprits. I hearby state I think he will show up allergic to wheat and dairy. I just bet. Now I wonder if eliminating the additional foods long-term will reduce his hyperactivity and distractibility as well? (adhd) Hoping he feels better soon. Trying to learn all about this disease....maybe you are too. I'm sorry that you have to deal with this, but hopefully now that you have a diagnosis ... you can figure out the trigger food(s) & your ds will start to feel better. My son scoped perfectly clean visually and histologically with no eosinophils in his esophagus, stomach, or duodenum after being on swallowed flovent and omeprazole for 8 week! 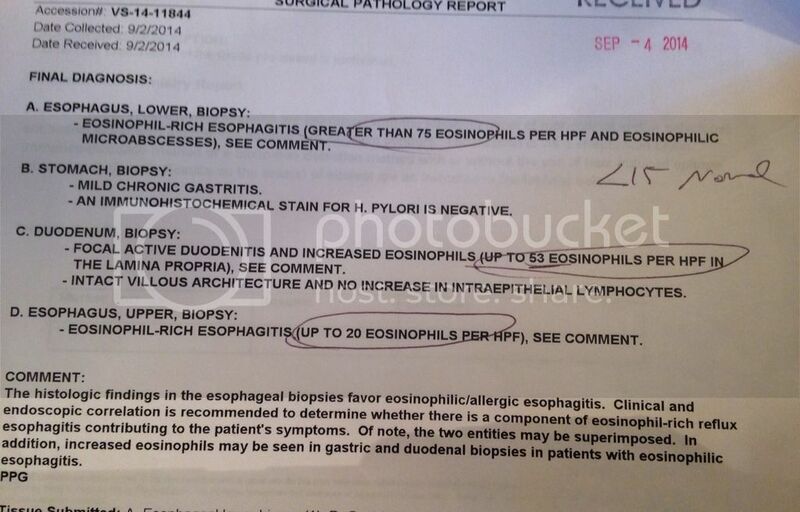 After going off these meds and after embarking on a major elimination diet (eliminated @50 foods that came up positive on his skin/serum Ige testing), he STILL scoped with 80 eosinophils in the esophagus. This disease absolutely stinks. Most people can do well being off the top 6 EE triggers, but we can't even get that accomplished being off of 50 things!!?! And why on earth is my son making antibodies to absolutely everything? I'm at a loss. I would take his EA, PA, TNA over this crap any day and twice on Wednesday. ETA: on a positive note, his total IGE has gone down from 903 at dx to 671. In 5 months...I assume after eliminating all the Ige positive foods. ETA: and we have been flirting with the idea of a g-tube due to significant weight loss, he is terribly thin and we are trying to supplement with prescription amino acid formula, which he hates. OH gosh, lilpig, this must be so hard for you all. The g-tube decision cannot be an easy one. Did you ever do a PPI trial to rule out that this is caused by reflux? I see you were scoped and diagnosed on the first scope. Was your child on a PPI for 6 to 9 weeks before that first scope? Reflux and EoE can't be told apart without the PPI trial or the new gene assay test that uses some biopsied tissue. It sounds like your doc then put your child on both a PPI and swallowed steroids, then took your child off both and on an elimination diet. If so, that sounds like your child may not have ever scoped after being on *just* a PPI without any food eliminations or swallowed steroid. Skin and blood testing are not a good way to find EoE trigger foods. They are testing for IgE mediated food allergies and EoE isn't IgE mediated. Most EoE docs would not recommend pulling that many things based only on testing and would not recommend doing so if it wasn't helping. Have you found a way to get a clear scope other than the meds? If the meds were working, why stop them? I was just reading through some posts and saw this. There is a subgroup of EoE cases where the triggers are also IgE mediated allergies in the patient. It is not as common as having the triggers be mediated by whatever the other antibody that usually triggers EoE, but it does occur. My son happens to be one of the people in this subgroup. He tests positive on both skin prick tests and blood tests to his triggers. He has several foods that he tests positive to on spt or RAST, but he only has classic IgE mediated reactions to some of them. Some of the others mostly just trigger his EoE (other than maybe eczema). Like dairy. We had no idea he was allergic to dairy, but when we pulled it from his diet, his EoE symptoms disappeared. He tested positive on the skin and blood tests for it. It's easier to test these patients, but the steroids generally don't work as well for them (as I understand it). I do know that there are some doctors not as up on the research of EoE that believe that standard way to test is by doing a RAST or SPT, and that it is not accurate for most people, but it is for this particular subgroup of patients. We on a PPI prior to second scope, because I insisted. Our doc was somewhat unconventional in his approach. We got the clean scope after PPI and eliminations. He is now off of all meds. We are in the long process of re-introducing foods. We have passed, beef, corn, wheat, tomato, rice. We found that milk is a huge EOE trigger for him. I recently told the GI we wanted to add everything back into his diet aside from soy, fish, shellfish, his known EOE trigger (milk) and his classic allergies (egg, pn, tn). We are anxiously awaiting the results next week. This will take years and years off of our scoping protocol if he passes, and helps rectify the somewhat backwards approach. I am praying. My daughter was diagnosed last year with EOE as well. LiP it's good to see you. I was thinking of you last week and wonderful how you are. I'm so sorry that your DD was diagnosed, too. Now wow--really glad your DS has been able to add those things. What a journey you've been on! Know that you have folks here who think about you.